John Nerud has a lot on his mind these days. He is studying all the Triple Crown participants and funneling in as much information about the contenders as he can from whatever sources available. He is preparing a candid (what else?) 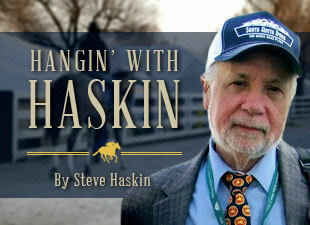 and blunt article on the Lasix situation, NYRA, and other pertinent matters concerning racing. He’s been consulting with Breeders’ Cup officials on how to improve the event that he and John Gaines started in 1984. And of course he’s overseeing the few horses he has up at Sugar Maple Farm in upstate New York. After all, what else is there to do when you’re 99 years old and the passion of Thoroughbred racing still burns within as it did back in the heyday of Dr. Fager, Gallant Man, Ta Wee, and the numerous other great champions Nerud owned, bred, or trained, whether by himself or for William McKnight’s Tartan Stable? Nerud not only was responsible for some of the most successful racehorses ever, he also was a maker of stallions. Gallant Man became a strong influence at stud; Dr. Fager was the leading sire in America, and Nerud’s two crowning achievements at stud, Fappiano and Cozzene, both of whom he owned and bred, paid for his estate in Old Brookville, N.Y.
Cozzene, the last of the great Nerud influences, passed away in 2008 at the age of 28 from melanoma, which he had lived with for several years. While most stallions have been pensioned by age 28, many well before that, Cozzene continued breeding until pretty much the day he died. Shortly before his death, he was bred to the Lemon Drop Kid mare Lemon Drop Cello. The following year, Lemon Drop Cello gave birth to a gray/roan colt later to be named Cozzetti, who will be running in Saturday’s Preakness Stakes (gr. I) for trainer Dale Romans and owner Albaugh Family Stables. It’s not every day you see a horse conceived by a 28-year-old stallion. But this was a John Nerud-bred stallion, and anything produced by Nerud had to be tough. He wouldn’t have it any other way. Cozzene was bred to 38 mares the year he died and got 26 of them in foal. To Nerud, it’s no big deal to have a stallion still serving active duty at an old age. How tough was Cozzene? He raced his entire career with a chipped sesamoid behind, something he had all his life. Among his many stakes victories was an impressive score in the Breeders’ Cup Mile (gr. I) in 1985. As a stallion, he had the unique distinction at the time of siring Breeders’ Cup Classic (gr. I) winner Alphabet Soup and Breeders’ Cup Turf (gr. IT) winner Tikkanen. Before Cozzene won the Breeders’ Cup Mile, Nerud sold 10 shares in him at $40,000 a share. After the Breeders’ Cup, he sold 20 shares at $60,000 a share, while keeping a quarter-interest for himself. Nerud made millions from Cozzene alone. Add Fappiano, and let’s just say that Nerud has been comfortable ever since. When Tartan Stable disbanded, Nerud continued to breed about 10 or 11 mares, and to get three grade I winners (Cozzene, Fappiano, and Clabber Girl) from those 10 or 11 mares was pretty remarkable. Now, here is Cozzene represented by a Preakness starter, who has rallied to finish third in the Tampa Bay Derby (gr. II) and fourth in the Arkansas Derby (gr. I), in which he was beaten a head and a neck for second. So, if you’re ever feeling old and way past your prime, and feel you have nothing more to contribute, just keep an eye on Cozzetti in the final eighth of a mile of the Preakness, and keep reminding yourself that his sire was the equivalent of an 80-year-old person when he conceived him and his sire’s owner was 95. And at the time of conception, Cozzene was 23 years older than the mare.